I dropped by Friends of the Earth when D was chillaxing with a work colleague; I picked up aduki's vegan shopping guide and 'from little things big things grow' illustrated by kids of the Gurinji, and I am totally going to drop back in the next chance I get. All sorts of activist stuff and some great books and they also do meals, which I am keen to try. J, D and I wandered in to the Radical Grocery, where I picked up some raw chocolate, as I've never tried it before. I also picked up aduki's soup book, which I noticed is authored by the people at Las Vegan. It looks pretty great (and I've already tried one recipe and it was delicious). If I lived in Melbourne I would totally have been stocking my freezer, for serious. In other news, Lush no longer sells vegan lip balm! Super disappointing. Our original plan for Sunday morning was a trek out to Box Hill for yum cha: however with our flight leaving at 1510, and our dreadful experience on Thursday where we missed the plane, we decided not to risk it. Instead we took the short trip to Ceres instead, where we commandeered three tables and several hours and delighted in all the beautiful dogs to wander by. I love Ceres, the ambiance is so great and it's laid back and it's like a world full of hippies. 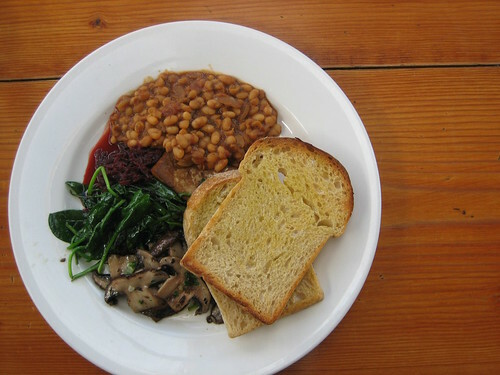 The big vegan breakfast was delicious, the beans and the smoked tofu were definitely highlights but the mushrooms, spinach and toast were also fantastic. The big vegan breakfast was also served with a beetroot relish, which D enjoyed but which was not really my thing. Overall A++ for the meal, though I was disappointed that there was not more smoked tofu, it was so good. D also tried the soy chai, on recommendation of everyone, and declared it okay (SJ and J also had the soy chai, and are obsessed, I think). We picked up a brownie to take on the plane with us. It was okay, though a bit dry, which could be accounted for by the fact that it knocked around in my bag for several hours and then was sitting around on the plane for a while. It was quite oily, which was a bit of a turn off. The reason for our whirlwind trip to Melbourne was to celebrate the birthday of our friend Amanda. It was her wish to have a Deadwood themed birthday party at Coco Loco, and we were only too happy to oblige, so we rocked on over in our waistcoats with our neck-kerchiefs, and SJ baked a delicious vegan and gluten-free cake shaped like a can of peaches. 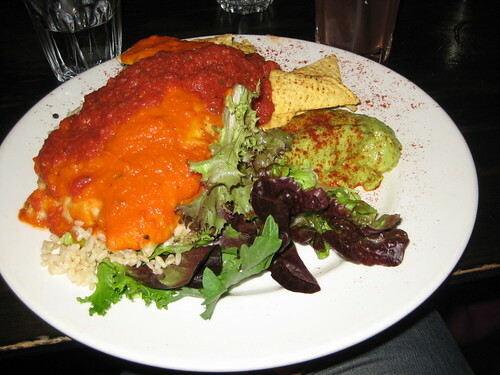 A great number of the things on the Coco Loco menu are vegan without even trying. The presentation is beautiful and the waitstaff are quite helpful. They didn't even charge us cakeage! But it is not a fast evening, we ordered about 1930, and the last in our party of 20 received their crepes at about 2200. The owner literally made every single drink and every single item of food, it was delicious but oh so rich and certainly the size was perhaps a shock (ie the items were quite small), but given the quality of the food it is not so much of a surprise. We also had a bit of an issue with our booking, by which I mean the booking was made a month ago and subsequently lost, though in the end all was okay. It is for these reasons that I am hesitant to give it a hearty recommendation: it was an enjoyable evening, spent with my Melbourne-based friends, and the quality of consumables was very high (though quite rich and in some instances somewhat bitter), but the experience was perhaps not the best of recent memory. 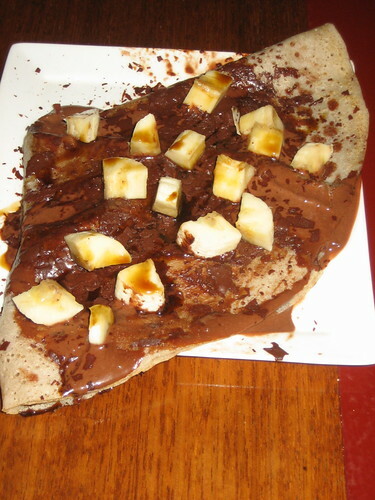 I understand that takeaway can be quite good, though by the time you get home to eat it the crepes are cold and allegedly not so delicious. We knew, regardless of other restaurants, that we had to get to Lord of the Fries at some point this weekend. We managed to wander in there finally on Saturday morning, after a quick visit to J at Tea Party at the QVM, where we picked up some delicious smelling teas (if you are traveling to WA, don't pick a tea with orange rind in it, quarantine frowns at that). The burger was as always delicious. 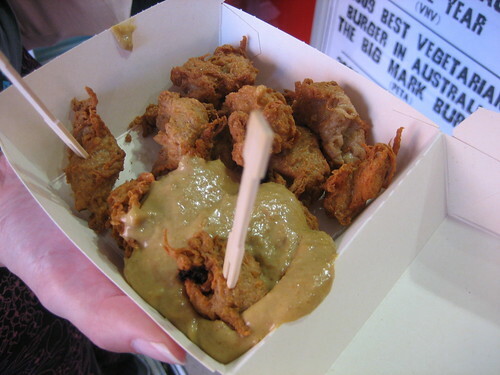 We had the Thai sauce with both the fries and the nuggets, and I laughed as we bit into the nuggets: they are exactly the same as the fake chicken that my mum and I buy from Lotus, and which I currently have in my freezer, so I will definitely be recreating the nugget and thai sauce experience quite shortly. On Friday night we picked the Vegie Bar, not particularly because it's fantastic but because we had a number of non-vegoes coming to dinner, and the Vegie Bar always seems to be the choice in those instances. If anyone else has a better suggestion, I am open to them, please do not hesitate. Because the dinner party was a bit impromptu, it wasn't until late Friday afternoon that I thought to book. Availing myself of the Optus connect number (which I loathe using), the Vegie Bar squeezed the ten of us in at 2030. Arriving later that evening, we were very glad we had thought to make a booking: the place was, as always, ridiculously chockas. 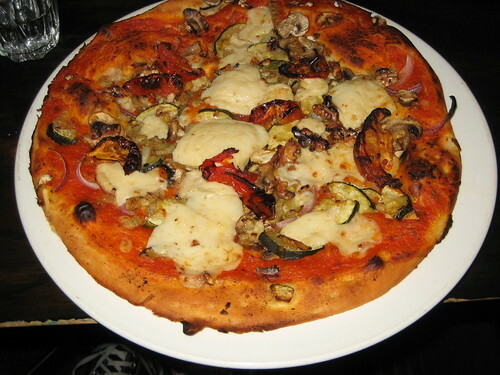 I'm not sure what I was expecting of the Vegan Supreme, but whilst it was perfectly serviceable it sat heavily in my stomach and I didn't enjoy the giant lumps of soy cheese, so I doubt I'll be eating that again. D's burrito on the other hand was incredibly delicious, quite tasty and D rolled out of there, full of deliciousness. The Vegie Bar serves its purpose, but I do prefer other locations. Met up with the delightful J at Sugardough for a chat and a bite to eat before tackling the op shops on Sydney Road. There was a small but excellent array of vegan baked treats on the counter. 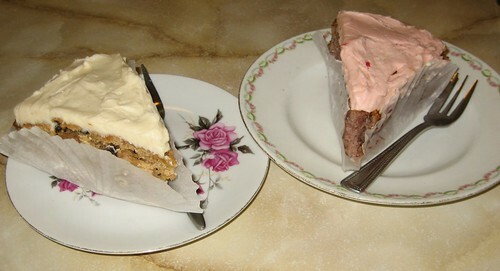 D left the decision up to me, and I selected the raspberry apple tea cake and the apple cinnamon cake. These were both soft and moist, and though the raspberry cake was a little sweet, it was not uncomfortably so, and I we enjoyed both immensely. The drinks board touts a milkshake with soymilk, and I was excited at the idea: I was therefore incredibly disappointed when the counterhand paused, "dairy icecream is okay, yes?" No, dairy icecream is not okay, what is the point in offering soy milk with dairy icecream? Such a ridiculous concept is not just a problem for vegans: those who are lactose intolerant (as, incidentally, I am) are still going to be so disappointed, as I was. I long for an excellent soy milkshake, I have yet to partake of one. I like the ambiance of Sugardough, it is tiny and adorable and their saucers and cups are great. And they sell Tea Party tea! The juice at least was delicious, and the cakes were fabulous, so I suppose I can forgive them for their milkshake travesty. We wandered in to Collingwood to check out a photography showing in which I was particularly interested, then out again and in to the Crumpler store on Smith Street. Resisting temptation, we stumbled out again and popped in to Las Vegan Nirvana Bakery, just down the road and fetchingly kitted out with stars and toys and a picket fence. 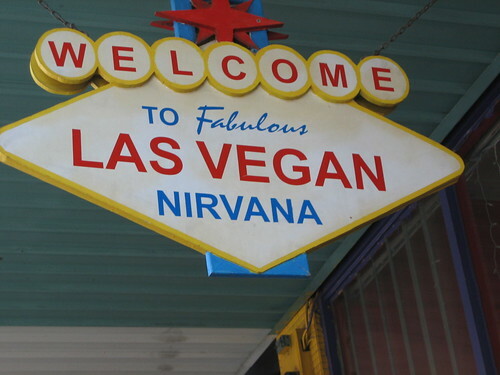 We had been alerted in advance in regards to Las Vegan's erratic opening hours, so we made sure we knew where Trippy Taco was located before seeking Las Vegan out. However to our delight it was open, and we found ourselves positively spoilt for choice, an entire menu completely vegan! The novelty is fabulous, an entire menu where we can eat everything. We sat outside on the footpath, and drank chai and fresh orange juice. 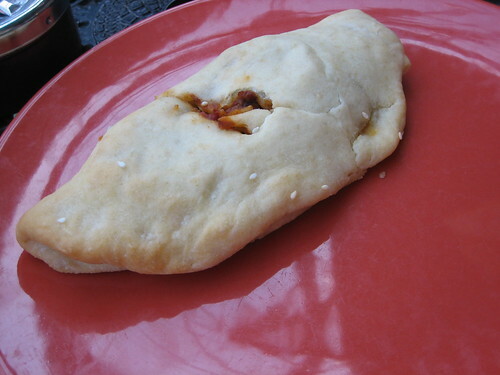 I tried the kidney bean calzone, which had a slight bite to it, but just enough to delight. I would definitely eat it again. D's tofu and tempeh wrap was kind of like a gado gado attempting to escape a thin layer of lavash bread, the tempeh was a bit of whatever but the tofu was quite delicious. We ended up quite full, so we picked up a piece of citrus coconut cake for later consumption (breakfast the next day, as it turned out), and were super excited to find the total incredibly awesomely cheap (at least by our standards; we're from Perth, where food is expensive). Having heard so much about the East Brunswick Club, on Thursday we wandered in for an early dinner. The thing I love about the EBC is that it's trashy pub food in an average pub, but there's a whole heap of vegan stuff on the menu (and a vegan meal of the day). 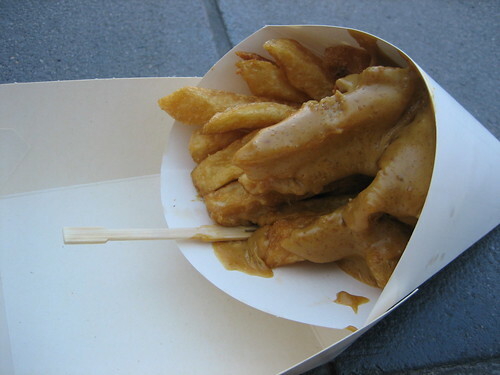 It's just so exciting, given in pubs we usually have to settle for wedges or chips. 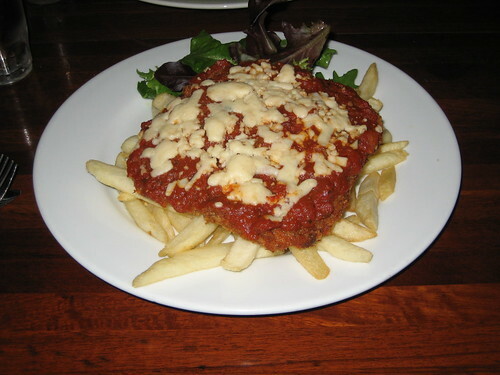 I tried the vegan parma, which I'd heard wasn't fantastic but I used to love parma, it was my trashy cafe standard and I was excited to give it a go. It was quite tasty! Obviously fake meaty but still really good. 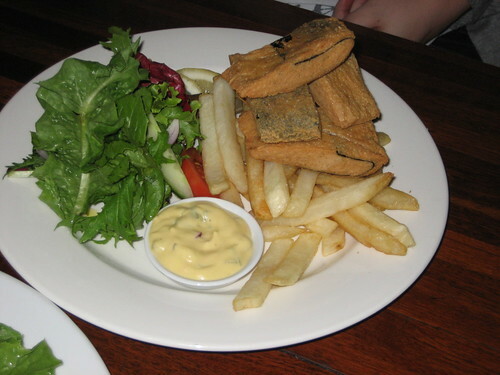 SJ had the fish and chips, which were suitably fishy - kind of creepily fishy, in fact. 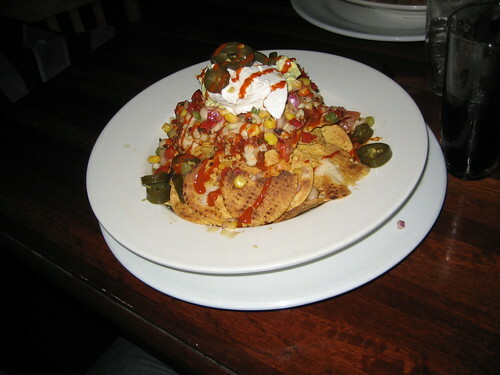 D had the nachoes, which were super delicious and massive, with vegan sour cream and everything. EBC has vegan desserts, but we were too full to give it a go! Alas, etc. After managing to miss our flight to Melbourne (not our fault, thanks, Qantas), D + I managed to rebook on the next one. This meant that there was no food for us, nothing in the airport except fruit and nothing on the plane except bread. We landed in Melbourne and were swept away to deliver Essie to Uni Melb, by which time it was 1630 Melbourne time and we'd had nothing to eat all day but watermelon and oreos. Castros ordinarily provides vegan pies, but had sold out for the day and we made do with a vegan apple muffin. Essie wandered off to class and we were bursting with sugar, so we meandered over to Union House where we found the Co-Op still open, and serving lentil soup with rice. It was delicious and super satisfying. My childhood memories are filled with spices: eyes watering as my mum added too much chilli; ears echoing as she pounded spice using mortar and pestle; hiding in the front room as she made blachan. Nonya (from the Malaysian Straits) curries are heavy with chilli and coconut and simmered for hours. The smell weaves through the house and you know deliciousness is ever so slowly nearing. 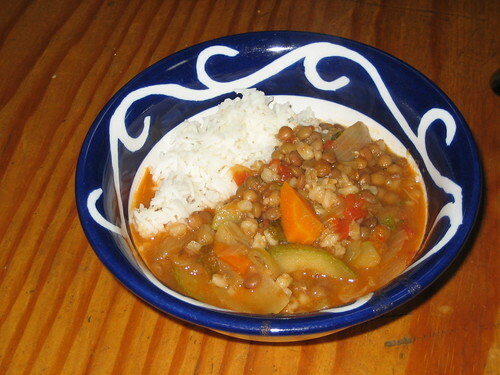 There is a comfort there, still, in curries on all days, no need to restrict them to only cold days. Kari Kapitan is one of the first things I learnt to cook, I was reluctant to leave my mum's daily provisions without being able to provide it for myself. After we went vegetarian, I did not even try to convert this, because the way the chicken falls from the bone is such an integral part to the dish's flavour, I thought I would not be able to replicate it, and I wanted to leave it perfect in my memory rather than mess it all up. In January, in preparation for a curry party (which I will blog about eventually), I took a leap of faith and gave it a go, using mock meat (which I never use), and I was so excited as the smells started to float through the house, the chilli and the potato and the garamasala. When I sat down I tried my own curry first, such a slight but I couldn't wait, and it was just as I remembered, the bite of the chilli and the gravy, coconuty and sour and just perfect. It's so important to me that after all this time, I am able to have one of my favourite foods, something that I thought I wouldn't get to eat ever again. This is the first time I've posted a recipe with mock meat, as I try not to eat it too often, but in this instance there is nothing that will give quite the same texture and result. And it's such a wonderful result. This is a very simple version of an old favourite. It can get more complicated than this, but this is a great way to indulge in an old favourite without too much trouble. Mock chicken is not for everyone. It's made from gluten, or soy, and occasionally dairy, so check the packet. Using a thin-bottom pot, fry the shallot (sliced) in some peanut oil with the garlic, until it starts to discolour. Mix together the chilli and garamasala with a little water until a thick paste is formed, and add this paste, as well as the mock chicken, to the pot. Braise the chicken, and coat well in the paste. Add the potato, tomato, lime kaffir leaves and curry leaves, as well as the stock. Add extra water so that the ingredients are almost but not totally covered. Simmer on low heat with the lid on for about thirty minutes, then add the snake beans. Add extra water if necessary, and replace the lid. Simmer or another twenty minutes, then add the coconut milk. Leave to simmer with the lid off for ten minutes. 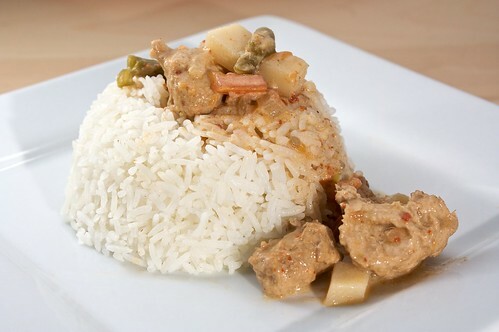 Smother rice in the gravy and serve. I am posting this for the WYF Cuisine Event. Although we had a delicious bread success last month, D and I are revising the bread making, in the hopes of creating the perfect bread. Our most recent attempt saw us lengthening the second kneading, extending it up to about ten minutes. 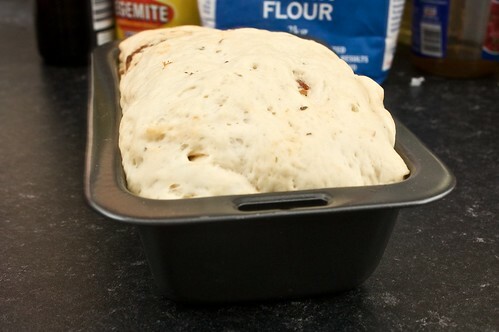 We then pushed the dough into the greased baking tray, and left it for a second rising, of about forty-five minutes. This allowed the dough to seal in those places where we had mixed in tomatoes and oil. I think next time I'm going to reduce the amount of sugar in the initial dough, in the hopes it strengthens the gluten strands. Vegetus shared this recipe yesterday, and D and I promptly gave it a go this evening, with a few modifications. 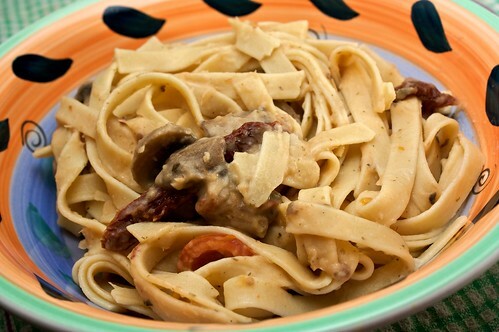 It was quite easy, done in the length of time it takes to boil the fettuccine, and it was tasty. blend the cannellini beans with a little soy until a nice smooth sauce forms. prepare the pasta. fry the garlic with the parsley and marjoram in a tablespoon or two of olive oil. add the mushrooms and fry until soft and almost cooked through, then add the sun-dried tomato. 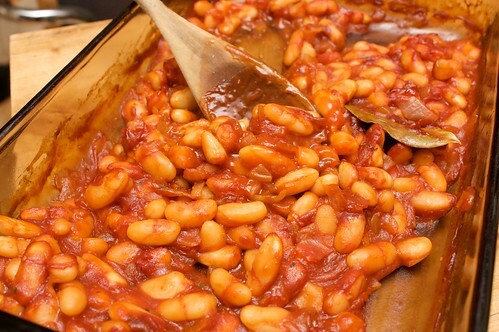 after frying for five minutes, add the beans. simmer on low for three or four minutes, adding more soy milk if necessary. remove sauce from heat. add cherry tomatoes and leave the lid on for a couple of minutes, so the tomatoes start to soften. add the drained pasta and mix through well. serve warm. Hot cross buns are delicious religious iconography, a sweet spiced bun with fruit inside and a cross on top of sugar; or scandalously with no fruit or even with chocolate (SCANDAL) (delicious, delicious scandal). 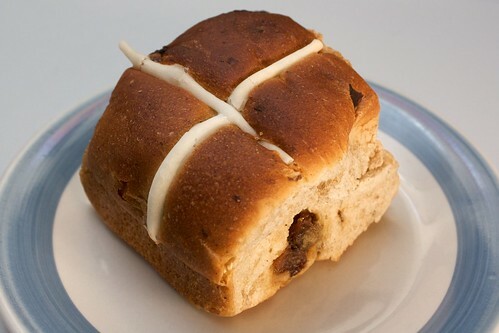 Hot cross buns are an Easter thing, but I don't think they have a specific symbolism. Certainly I can't remember any details from my seven years of Catholic primary school, and wikipedia doesn't have anything constructive to add. Whatever the reason, they are super delicious, and it is a shame they are only available in the lead up to Good Friday. These are storebought, standard from Coles. IGA also does a vegan bun. Please note that many other hot cross buns are not vegan (Woolies and tiptop, for example). 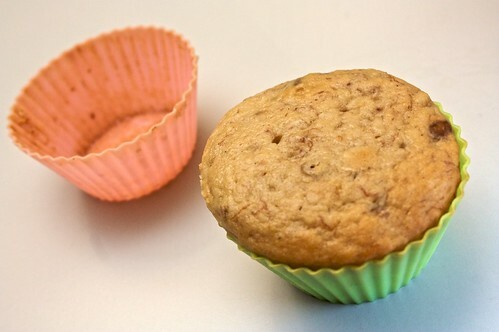 I had two softening bananas, just going brown, and half a cup of walnuts sitting around doing nothing, so on Monday afternoon I took a break from studying to bake some banana and walnut muffins. They were soft and pretty tasty. I also like to sub chocolate chips for the walnuts. Sift together the flour, baking powder, cinnamon and sugar. Mix in the vanilla essence, apple sauce and nuttelex, then slowly pour in the soy milk. Add the walnuts and the mashed bananas, mix well but do not overmix. Divide in to twelve greased muffin molds (or similar), and bake at 180C for about 20 minutes. Yesterday (Monday) was a public holiday, so after a bit of a sleep-in I rolled out of bed and sleepily started dicing onions in an attempt to make the cheater baked beans from Veganomicon. Following a conversation with Christine, who the previous morning had advised not baking the beans for the full hour, I cut the baking time down to 35 minutes. I think they probably could have done with a little longer. I halved the recipe, and skipped the mustard, and found that the amount of beans was just perfect, and the taste, as advised, was super delicious. The aforementioned Christine had (delightfully!) turned up at breakfast the previous morning with a spare bag of nutritional yeast flakes, so I took this opportunity to make french toast. 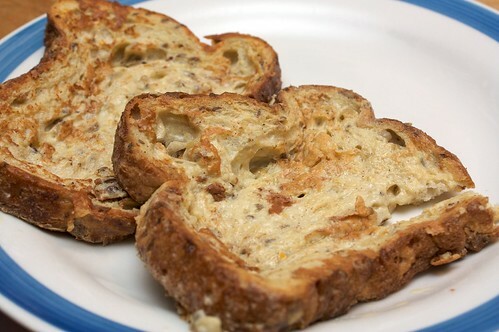 The resulting soggy mixture was awesome, with an eggy consistency, sugary bread, deliciously gorengan, and it was just great. I will definitely be making both of these things again. Whisk together the soy milk, nutritional yeast, flour, cinnamon and sugar. Dip the bread in the mixture, soaking both sides. Oil a fry pan with margarine or oil (I used olive oil), and have the heat up high ish but not too high. Cook each side for about a minute and a half, until the edges have crisped up but the insides are still soggy - this is just my personal preference, you might want the centre to also be crisp. Serve hot. Met up with Christine for a mid-morning breakfast yesterday, at Diva Cafe. 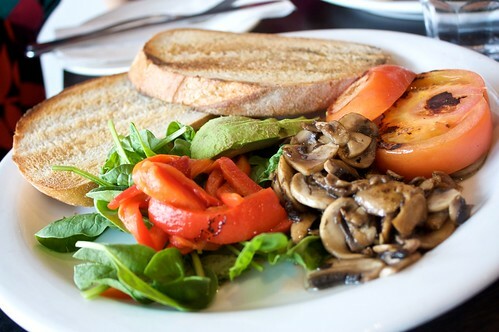 We all had the vegetarian breakfast, no eggs, no ricotta, and D and I ordered some tomatoes to go with the marinated capsicum, spinach, mushrooms, avocado and toast. I love fresh avocado on toast for breakfast, so fantastic. The meal was tasty, the capsicum quite good and the mushies also. They do fresh orange juice, which I always appreciate. Service was okay, our meals and drinks were quite prompt, but our empty plates sat in front of us for about an hour before someone came to take them away, and though we sat there for three hours, chatting in the morning sun, nobody offered us anything extra to drink, which I thought was a bit odd, given they didn't seem super busy. I would eat there for breakfast again, but probably not before I try some of the other places along that end of Beaufort Street.